This article is about the ethno-linguistic group. For the inhabitants of Iran, see Persian people and Demographics of Iran. For the historical Indo-Iranians, see Indo-Iranians. Proto-Iranians are believed to have emerged as a separate branch of the Indo-Iranians in Central Asia in the mid-2nd millennium BC. At their peak of expansion in the mid-1st millennium BC, the territory of the Iranian peoples stretched across the Iranian Plateau and the entire Eurasian Steppe from the Great Hungarian Plain in the west to the Ordos Plateau in the east. The Western Iranian Persian Empires came to dominate much of the ancient world from the 6th century BC, leaving an important cultural legacy, while the Eastern Iranians of the steppe played a decisive role in the development of Eurasian nomadism, the Silk Route and later significantly contributed to the Islamic Golden Age in Khorasan. Ancient Iranian peoples who emerged after 1000 BC include the Persians, Parthians, Medes, Scythians, Alans, Bactrians, Dahae, Massagetae, Khwarezmians, Saka, Sarmatians, Sogdians, Sagartians, probably Cimmerians and other peoples of Central Asia, the Caucasus, Eastern Europe and the Iranian Plateau. In the 1st millennium AD, their area of settlement was reduced as a result of Slavic, Germanic, Turkic and Mongol expansions and many being subjected to Slavicisation. Modern Iranian peoples include the Baloch, Gilaks, Kurds, Lurs, Mazanderanis, Ossetians, Pashtuns, Pamiris, Persians, Tajiks, the Talysh, Tati, Wakhis and Yaghnobis. Their current distribution spreads across the Iranian Plateau and stretches from the Caucasus in the north to the Persian Gulf in the south and from Xinjiang in the east to eastern Turkey in the west—a region that is sometimes called the Iranian cultural continent—and represents the extent of the Iranian languages and significant influence of the Iranian peoples through the geopolitical reach of Greater Iran. Unlike the Sanskrit ā́rya- (Aryan), the Old Iranian term has solely an ethnic meaning. Today, the Old Iranian arya- remains in ethno-linguistic names such as Iran, Alan, Ir, and Iron. In the Iranian languages, the gentilic is attested as a self-identifier included in ancient inscriptions and the literature of Avesta. [lower-alpha 1] The earliest epigraphically attested reference to the word arya- occurs in the Bistun Inscription of the 6th century BC. The inscription of Bistun (or Behistun; Old Persian: Bagastana) describes itself to have been composed in Arya [language or script]. As is also the case for all other Old Iranian language usage, the arya of the inscription does not signify anything but Iranian. From the late 2nd millennium BCE to early 1st millennium BCE the Iranians had expanded from the Eurasian Steppe, and Iranian peoples such as Medes, Persians, Bactrians, and Parthians populated the Iranian plateau. Scythian tribes, along with Cimmerians, Sarmatians and Alans populated the steppes north of the Black Sea. The Scythian and Sarmatian tribes were spread across Great Hungarian Plain, South-Eastern Ukraine, Russias Siberian, Southern, Volga, Uralic regions and the Balkans, while other Scythian tribes, such as the Saka, spread as far east as Xinjiang, China. Scythians as well formed the Indo-Scythian Empire, and Bactrians formed a Greco-Bactrian Kingdom founded by Diodotus I, the satrap of Bactria. The Kushan Empire, with Bactrian roots/connections, once controlled much of Pakistan, Afghanistan, and Tajikistan. The Kushan elite (who the Chinese called the Yuezhi) were either a Tocharian-speaking (another Indo-European branch) people or an Eastern Iranian language-speaking people. Later on, in 550 BC, Cyrus the Great, would overthrow the leading Median rule, and conquer Kingdom of Lydia and the Babylonian Empire after which he established the Achaemenid Empire (or the First Persian Empire), while his successors would dramatically extend its borders. At its greatest extent, the Achaemenid Empire would encompass swaths of territory across three continents, namely Europe, Africa and Asia, stretching from the Balkans and Eastern Europe proper in the west, to the Indus Valley in the east. The largest empire of ancient history, with their base in Persis (although the main capital was located in Babylon) the Achaemenids would rule much of the known ancient world for centuries. This First Persian Empire was equally notable for its successful model of a centralised, bureaucratic administration (through satraps under a king) and a government working to the profit of its subjects, for building infrastructure such as a postal system and road systems and the use of an official language across its territories and a large professional army and civil services (inspiring similar systems in later empires), and for emancipation of slaves including the Jewish exiles in Babylon, and is noted in Western history as the antagonist of the Greek city states during the Greco-Persian Wars. The Mausoleum at Halicarnassus, one of the Seven Wonders of the Ancient World, was built in the empire as well. The Greco-Persian Wars resulted in the Persians being forced to withdraw from their European territories, setting the direct further course of history of Greece and the rest of Europe. More than a century later, a prince of Macedon (which itself was a subject to Persia from the late 6th century BC up to the First Persian invasion of Greece) later known by the name of Alexander the Great, overthrew the incumbent Persian king, by which the Achaemenid Empire was ended. The Sarmatians differed from the Scythians in their veneration of the god of fire rather than god of nature, and women's prominent role in warfare, which possibly served as the inspiration for the Amazons. At their greatest reported extent, around the 1st century AD, these tribes ranged from the Vistula River to the mouth of the Danube and eastward to the Volga, bordering the shores of the Black and Caspian Seas as well as the Caucasus to the south. Their territory, which was known as Sarmatia to Greco-Roman ethnographers, corresponded to the western part of greater Scythia (mostly modern Ukraine and Southern Russia, also to a smaller extent north eastern Balkans around Moldova). According to authors Arrowsmith, Fellowes and Graves Hansard in their book A Grammar of Ancient Geography published in 1832, Sarmatia had two parts, Sarmatia Europea and Sarmatia Asiatica covering a combined area of 503,000 sq mi or 1,302,764 km2. Throughout the first millennium AD, the large presence of the Sarmatians who once dominated Ukraine, Southern European Russia, and swaths of the Balkans, gradually started to diminish mainly due to assimilation and absorption by the Germanic Goths, especially from the areas near the Roman frontier, but only completely and climactically by the (Proto-Slavic peoples. The abundant East Iranian-derived toponyms in Eastern Europe proper (e.g. some of the largest rivers; the Dniestr and Dniepr) and the Balkans, as well as loanwords adopted predominantly through the Eastern Slavic languages and adopted aspects of Iranian culture amongst the early Slavs, are all a remnant of this. A connection between Proto-Slavonic and Iranian languages is also furthermore proven by the earliest layer of loanwords in the former. For instance, the Proto-Slavonic words for god (*bogъ), demon (*divъ), house (*xata), axe (*toporъ) and dog (*sobaka) are of Scythian origin. The Sarmatians of the east, based in the North Caucasus, became the Alans, who also ventured far and wide, with a branch ending up in Western Europe and North Africa, as they accompanied the Germanic Vandals during their migrations. The modern Ossetians are believed to be the sole direct descendants of the Alans, as other remnants of the Alans disappeared following Germanic, Hunnic and ultimately Slavic migrations and invasions. Another group of Alans allied with Goths to defeat the Romans and ultimately settled in what is now called Catalonia (Goth-Alania). With numerous artistic, scientific, architectural and philosophical achievements and numerous kingdoms and empires that bridged much of the civilized world in antiquity, the Iranian peoples were often in close contact with the Greeks, Romans, Egyptians, Indians, Armenians, Caucasians, Chinese, Turks and Arabs. The various religions of the Iranian people, including Zoroastrianism, Mithraism and Manichaeism, are believed by some scholars to have been significant early philosophical influences on Christianity and Judaism. Like other Indo-Europeans, the early Iranians practiced ritual sacrifice, had a social hierarchy consisting of warriors, clerics and farmers and poetic hymns and sagas to recount their deeds. Following the Iranian split from the Indo-Iranians, the Iranians developed an increasingly distinct culture. Various common traits can be discerned among the Iranian peoples. For example, the social event Norouz is an Iranian festival that is practiced by nearly all of the Iranian peoples as well as others in the region. Its origins are traced to Zoroastrianism and pre-historic times. Some Iranian cultures exhibit traits that are unique unto themselves. The Pashtuns adhere to a code of honor and culture known as Pashtunwali, which has a similar counterpart among the Baloch, called Mayar, that is more hierarchical. The early Iranian peoples worshipped various deities of found throughout Proto-Indo-Iranian religion where Indo-European immigrants established themselves. The earliest major religion of the Iranian peoples was Zoroastrianism, which spread to nearly all of the Iranian peoples living in the Iranian plateau. Other religions that had their origins in the Iranian world were Mithraism, Manichaeism, and Mazdakism, among others. Modern speakers of Iranian languages mainly follow Islam. Some follow Judaism, Christianity, Zoroastrianism, and the Bahá'í Faith, with an unknown number showing no religious affiliation. Overall the numbers of Sunni and Shia among the Iranian peoples are equally distributed. Most Kurds, Tajiks, Pashtuns, and Baloch are Sunni Muslims, while the remainder are mainly Twelver Shi'a, comprising mostly Persians in Iran. Zazas in Turkey are largely Alevi, while the Pamiri peoples in Tajikistan and China are nearly all Ismaili. The Christian community is mainly represented by the Armenian Apostolic Church, followed by the Russian Orthodox and Georgian Orthodox Ossetians followed by Nestorians. Judaism is followed mainly by Persian Jews, Kurdish Jews, Bukharian Jews (of Central Asia) and the Mountain Jews (of the Caucasus), most of whom are now found in Israel. The historical religion of the Persian Empire was Zoroastrianism and it still has a few thousand followers, mostly in Yazd and Kerman. They are known as the Parsis in the Indian subcontinent, where many of them fled in historic times following the Arab conquest of Persia, or Zoroastrians in Iran. Another ancient religion is the Yezidi faith of the ethno-religious group of the Yazidi people, followed by Yazidi people in northern Iraq, Syria, Turkey and in Armenia. Elements of pre-Islamic Zoroastrian and Paganistic beliefs persist among some Islamized groups today, such as the Persians, Tajiks, Pashtuns, Pamiris and Ossetians. In matters relating to culture, the various Turkic-speaking ethnic groups of Iran (notably the Azerbaijani people) and Afghanistan (Uzbeks and Turkmen) are often conversant in Iranian languages, in addition to their own Turkic languages and also have Iranian culture to the extent that the term Turko-Iranian can be applied. The usage applies to various circumstances that involve historic interaction, intermarriage, cultural assimilation, bilingualism and cultural overlap or commonalities. Notable among this synthesis of Turko-Iranian culture are the Azeris, whose culture, religion and significant periods of history are linked to the Persians. Certain theories and genetic tests suggest that the Azeris are genetically more Iranian than Turkic. Azeris: Although Azeris speak a Turkic language (modern Azerbaijani language), they are believed to be primarily descendants of ancient Iranians. Thus, due to their historical ties with various ancient Iranians, as well as their cultural ties to Persians, the Azeris are often associated with the Iranian peoples (see Origin of Azerbaijani people and the Iranian theory regarding the origin of the Azerbaijanis for more details). Turkmens: The Turkmen people are believed to be a mix of Iranian and Turkic ancestry. Genetic studies on mitochondrial DNA (mtDNA) restriction polymorphism confirmed that Turkmen were characterized by the presence of local Iranian mtDNA lineages, similar to the Eastern Iranian populations, but high male Mongoloid genetic component observed in Turkmens and Hazara in east Iran and Afghanistan with the frequencies of about 20%. This most likely indicates an ancestral combination of Iranian groups and Mongol that the modern Turkmen have inherited and which appears to correspond to the historical record which indicates that various Iranian tribes existed in the region prior to the migration of Turkic tribes who are believed to have merged with the local population and imparted their language and created something of a hybrid Turko-Iranian culture. Uzbeks: The modern Uzbek people are believed to have both Iranian and Turkic ancestry. "Uzbek" and "Tajik" are modern designations given to the culturally homogeneous, sedentary population of Central Asia. The local ancestors of both groups – the Turkic-speaking Uzbeks and the Iranian-speaking Tajiks – were known as "Sarts" ("sedentary merchants") prior to the Russian conquest of Central Asia, while "Uzbek" or "Turk" were the names given to the nomadic and semi-nomadic populations of the area. Still today, modern Uzbeks and Tajiks are known as "Sarts" to their Turkic neighbours, the Kazakhs and the Kyrgyz. The ancient Soghdians and Bactrians are among their ancestors. Culturally, the Uzbeks are closer to their sedentary Iranian-speaking neighbours rather than to their nomadic and semi-nomadic Turkic neighbours. Some Uzbek scholars, i.e. Ahmadov and Askarov, favour the Iranian origin theory. Uyghurs: Some Uyghurs are descendants of the Saka people in Buddhist Kingdom of Khotan. Speakers of Indo-Aryan languages share linguistic affinities with speakers of Iranian languages, which suggests a degree of historical interaction between these two groups. Shirazis: The Shirazi are a sub-group of the Swahili people living on the Swahili Coast of East Africa, especially on the islands of Zanzibar, Pemba and Comoros. Local traditions about their origin claim they are descended from merchant princes from Shiraz in Persia who settled along the Swahili Coast. J2-M172: is the most common Hg in Iran (~23%); almost exclusively represented by J2a-M410 subclade (93%), the other major sub-clade being J2b-M12. Apart from Iranians, J2 is common in Mediterranean and Balkan peoples (Croatians, Serbs, Greeks, Bosnians, Albanians, Italians, Bulgarians, Turks), in the Caucasus (Armenians, Georgia, northeastern Turkey, north/northwestern Iran, Kurds, Persians); whilst its frequency drops suddenly beyond Afghanistan, Pakistan and northern India. In Europe, J2a is more common in the southern Greece and southern Italy; whilst J2b (J2-M12) is more common in Thessaly, Macedonia and central – northern Italy. Thus J2a and its subgroups within it have a wide distribution from Italy to India, whilst J2b is mostly confined to the Balkans and Italy, being rare even in Turkey. Whilst closely linked with Anatolia and the Levant; and putative agricultural expansions, the distribution of the various sub-clades of J2 likely represents a number of migrational histories which require further elucidation. Iranians are only distantly related to Europeans as a whole, predominantly with southern Europeans like Greeks, Albanians, Serbs, Croatians, Italians, Bosniks, Spaniards, Macedonians, Portuguese, and Bulgarians, rather than northern Europeans like Norwegians, Danes, Swedes, Irish, Scottish, English, Finns, Estonians, Welsh, Latvians, and Lithuanians. Nevertheless, Iranian-speaking Central Asians do show closer affinity to Europeans than do Turkic-speaking Central Asians. ↑ In the Avesta the airiia- are members of the ethnic group of the Avesta-reciters themselves, in contradistinction to the anairiia-, the "non-Aryas". The word also appears four times in Old Persian: One is in the Behistun inscription, where ariya- is the name of a language or script (DB 4.89). The other three instances occur in Darius I's inscription at Naqsh-e Rustam (DNa 14–15), in Darius I's inscription at Susa (DSe 13–14), and in the inscription of Xerxes I at Persepolis (XPh 12–13). In these, the two Achaemenid dynasts describe themselves as pārsa pārsahyā puça ariya ariyaciça "a Persian, son of a Persian, an Ariya, of Ariya origin." "The phrase with ciça, “origin, descendance”, assures that it [i.e. ariya] is an ethnic name wider in meaning than pārsa and not a simple adjectival epithet". ↑ R.N Frye, "IRAN v. PEOPLE OF IRAN in Encyclopedia Iranica. "In the following discussion of "Iranian peoples," the term "Iranian" may be understood in two ways. It is, first of all, a linguistic classification, intended to designate any society which inherited or adopted, and transmitted, an Iranian language. The set of Iranian-speaking peoples is thus considered a kind of unity, in spite of their distinct lineage identities plus all the factors which may have further differentiated any one group’s sense of self." ↑ Mehrdad R. Izady (1992). The Kurds: A Concise Handbook. Taylor & Francis. ISBN 978-0-8448-1727-9. ↑ Michael M. Gunter (4 November 2010). Historical Dictionary of the Kurds. Scarecrow Press. ISBN 978-0-8108-7507-4. ↑ "IRAN vi. IRANIAN LANGUAGES AND SCRIPTS". Encyclopædia Iranica. Bibliotheca Persica Press. 15 December 2006. Retrieved 1 June 2015. ↑ Harmatta 1992, p. 348: "From the first millennium b.c., we have abundant historical, archaeological and linguistic sources for the location of the territory inhabited by the Iranian peoples. In this period the territory of the northern Iranians, they being equestrian nomads, extended over the whole zone of the steppes and the wooded steppes and even the semi-deserts from the Great Hungarian Plain to the Ordos in northern China." ↑ Annamoradnejad, Rahimberdi; Lotfi, Sedigheh (2010). "Demographic changes of nomadic communities in Iran (1956–2008)". Asian Population Studies. 6: 335–345. doi:10.1080/17441730.2010.512764. ↑ Emmerick, Ronald Eric. "Iranian languages". Encyclopædia Britannica Online. Encyclopædia Britannica, Inc. Retrieved 29 May 2015. ↑ Frye, Richard Nelson, Greater Iran, ISBN 1-56859-177-2 p.xi: "... Iran means all lands and people where Iranian languages were and are spoken, and where in the past, multi-faceted Iranian cultures existed. ..."
1 2 MacKenzie, David Niel (1998). "Ērān, Ērānšahr". Encyclopedia Iranica. 8. Costa Mesa: Mazda. ↑ G. Gnoli, "Iranian Identity as a Historical Problem: the Beginnings of a National Awareness under the Achaemenians," in The East and the Meaning of History. International Conference (23–27 November 1992), Roma, 1994, pp. 147–67. "?". 1 2 3 4 5 6 G. Gnoli, "Iranian Identity ii. Pre-Islamic Period" in Encyclopedia Iranica. Online accessed in 2010 at "?". 1 2 3 H. W. Bailey, "Arya" in Encyclopedia Iranica. Excerpt: "ARYA an ethnic epithet in the Achaemenid inscriptions and in the Zoroastrian Avestan tradition. "Arya an ethnic epithet in the Achaemenid inscriptions and in the Zoroastrian Avestan tradition". Archived from the original on 2013-01-03. Also accessed online in May, 2010. ↑ G. Gnoli. "ēr, ēr mazdēsn". Encyclopedia Iranica. 1 2 Bailey, Harold Walter (1987). "Arya". Encyclopedia Iranica. 2. New York: Routledge & Kegan Paul. pp. 681–683. 1 2 3 R. G. Kent. Old Persian. Grammar, texts, lexicon. 2nd ed., New Haven, Conn.
↑ Professor Gilbert Lazard: The language known as New Persian, which usually is called at this period (early Islamic times) by the name of Dari or Parsi-Dari, can be classified linguistically as a continuation of Middle Persian, the official religious and literary language of Sassanian Iran, itself a continuation of Old Persian, the language of the Achaemenids. Unlike the other languages and dialects, ancient and modern, of the Iranian group such as Avestan, Parthian, Soghdian, Kurdish, Ossetian, Balochi, Pashto, Armenian etc., Old Middle and New Persian represent one and the same language at three states of its history. It had its origin in Fars (the true Persian country from the historical point of view) and is differentiated by dialectical features, still easily recognizable from the dialect prevailing in north-western and eastern Iran in Lazard, Gilbert 1975, "The Rise of the New Persian Language" in Frye, R. N., The Cambridge History of Iran, Vol. 4, pp. 595–632, Cambridge: Cambridge University Press. 1 2 Meyer, Eduard (1911). "Iran". In Chisholm, Hugh. Encyclopædia Britannica. 742 (11th ed.). Cambridge University Press. p. 742. ↑ Beckwith 2009, p. 33 note 20, p.35. 1 2 Beckwith 2009, p. 33. ↑ Beckwith 2009, p. 376-7. ↑ Malory 1989, pp. 42–43. ↑ Anthony 2009, p. 390 (fig. 15.9), 405–411. ↑ Allentoft; Sikora; et al. (2015). "Population genomics of Bronze Age Eurasia". Nature. 522: 167–172. doi:10.1038/nature14507. ↑ Mallory 1997, pp. 20–21. ↑ Diakonoff 1995, p. 473. ↑ "Amazons in the Scythia: new finds at the Middle Don, Southern Russia". Taylorandfrancis.metapress.com. Retrieved 2009-06-21. ↑ "Secrets of the Dead, Casefile: Amazon Warrior Women". Pbs.org. Retrieved 2009-06-21. ↑ Tim McNeese. "The Volga River". p. 14. Retrieved 2018-07-11. ↑ Liverani, M. (1995). "The Medes at Esarhaddon's Court". Journal of Cuneiform Studies. 47: 57–62. doi:10.2307/1359815. ↑ "The Geography of Strabo" — University of Chicago. . Retrieved 4 June 2006. ↑ "Avestan xᵛarǝnah-, etymology and concept by Alexander Lubotsky" Archived 7 February 2006 at the Wayback Machine. — Sprache und Kultur. Akten der X. Fachtagung der Indogermanischen Gesellschaft, 22.-28. September 1996, ed. W. Meid, Innsbruck (IBS) 1998, 479–488. . Retrieved 4 June 2006. ↑ R. G. Kent, Old Persian: Grammar, texts and lexicon. ↑ R. Hallock (1969), Persepolis Fortification Tablets; A. L. Driver (1954), Aramaic Documents of the V Century BC. 1 2 3 4 Greek and Iranian, E. Tucker, A History of Ancient Greek: From the Beginnings to Late Antiquity, ed. Anastasios-Phoivos Christidēs, Maria Arapopoulou, Maria Chritē, (Cambridge University Press, 2001), 780. ↑ "Kurdish: An Indo-European Language By Siamak Rezaei Durroei" Archived 17 June 2006 at the Wayback Machine. — University of Edinburgh, School of Informatics. . Retrieved 4 June 2006. ↑ "The Iranian Language Family, Khodadad Rezakhani" Archived 9 October 2004 at the Wayback Machine. — Iranologie. . Retrieved 4 June 2006. ↑ "Sarmatian". Encyclopædia Britannica Online. Retrieved 31 December 2014. 1 2 A History of Russia by Nicholas Riasanovsky, pp. 11–18, Russia before the Russians, ISBN 0-19-515394-4 . Retrieved 4 June 2006. ↑ "Jeannine Davis-Kimball, Archaeologist" — Thirteen WNET New York. . Retrieved 4 June 2006. ↑ James Minahan, "One Europe, Many Nations", Published by Greenwood Publishing Group, 2000. pg 518: "The Ossetians, calling themselves Iristi and their homeland Iryston are the most northerly Iranian people. ... They are descended from a division of Sarmatians, the Alans who were pushed out of the Terek River lowlands and in the Caucasus foothills by invading Huns in the 4th century AD. ↑ "Ossetians". Encarta. Microsoft Corporation. 2008. ↑ From Scythia to Camelot by Littleton and Malcor, pp. 40–43, ISBN 0-8153-3566-0 . Retrieved 4 June 2006. ↑ "Report for Talysh" — Ethnologue. Retrieved 4 June 2006. ↑ "Report for Tats" — Ethnologue. . Retrieved 4 June 2006. ↑ "Report for Judeo-Tats" — Ethnologue. . Retrieved 4 June 2006. 1 2 Hamzehʼee, M. Reza. The Yaresan: a sociological, historical and religio-historical study of a Kurdish community, 1990. ↑ Nasidze, Ivan; Quinque, Dominique; Ozturk, Murat; Bendukidze, Nina; Stoneking, Mark (1 July 2005). "MtDNA and Y-chromosome Variation in Kurdish Groups". Ann. Hum. Genet. 69 (4): 401–412. doi:10.1046/j.1529-8817.2005.00174.x. PMID 15996169 – via Wiley Online Library. ↑ Kaya, Mehmed S. (15 June 2011). "The Zaza Kurds of Turkey: A Middle Eastern Minority in a Globalised Society". I.B.Tauris – via Amazon. ↑ J.E. Peterson. "Oman's Diverse Society" (PDF). p. 4. ↑ In Search of the Indo-Europeans, by J.P. Mallory, p. 112–127, ISBN 0-500-27616-1 . Retrieved 10 June 2006. ↑ "Pakistan — Baloch" — Library of Congress Country Studies . Retrieved 4 June 2006. ↑ "History of Iran-Chapter 2 Indo-Europeans and Indo-Iranians" Archived 25 April 2006 at the Wayback Machine. — Iranologie . Retrieved 4 June 2006. ↑ Turko-Persia in Historical Perspective, edited by Robert Canfield, ISBN 0-521-52291-9 . Retrieved 4 June 2006. ↑ "Azerbaijan-Iran Relations: Challenges and Prospects" Archived 1 September 2006 at the Wayback Machine. — Harvard University, Belfer Center, Caspian Studies Program . Retrieved 4 June 2006. ↑ "Cambridge Genetic Study of Iran" Archived 12 March 2007 at the Wayback Machine. — ISNA (Iranian Students News Agency), 06-12-2006, news-code: 8503-06068 . Retrieved 9 June 2006. ↑ R. N. Frye. "People of Iran". Encyclopedia Iranica. ↑ X.D. Planhol. "Lands of Iran". Encyclopedia Iranica. ↑ Yarshater, Ehsan (15 December 1988). "AZERBAIJAN vii. The Iranian Language of Azerbaijan". Encyclopædia Iranica. Bibliotheca Persica Press. Retrieved 3 May 2015. ↑ The Columbia Encyclopedia: Azerbaijan Archived 17 May 2006 at the Wayback Machine. ↑ "Who are the Azeris? by Aylinah Jurabchi". The Iranian. Retrieved 2009-06-21. ↑ ingentaconnect.com Archived 6 June 2011 at the Wayback Machine. ↑ Askarov, A. & B.Ahmadov, O'zbek Xalqning Kilib Chiqishi Torixi. O'zbekiston Ovozi, 20 January 1994. ↑ Regueiro; et al. (2006). "Iran: Tricontinental Nexus for Y-Chromosome Driven Migration". Hum Hered. 61: 132–143. doi:10.1159/000093774. PMID 16770078. ↑ Grugni (2012). "Ancient Migratory Events in the Middle East: New Clues from the Y-Chromosome Variation of Modern Iranians". PLOS ONE. 7: e41252. doi:10.1371/journal.pone.0041252. PMC 3399854 . PMID 22815981. ↑ Cinnioglu et al. Excavating Y-chromosome haplotype strata in Anatolia" Hum Genet 2004 Jan;114(2):127-48. Epub 2003 Oct 29. ↑ Semino, Ornella; et al. (May 2004). "Origin, Diffusion, and Differentiation of Y-Chromosome Haplogroups E and J: Inferences on the Neolithization of Europe and Later Migratory Events in the Mediterranean Area". American Journal of Human Genetics. 74 (5): 1023–1034. doi:10.1086/386295. PMC 1181965 . PMID 15069642. ↑ "Family Tree DNA – Genetic Testing for Ancestry, Family History & Genealogy". ↑ Pamjav; 2012. "Inner and Central Asia is an overlap zone for the R1a1-Z280 and R1a1-Z93 lineages. This pattern implies that an early differentiation zone of R1a1-M198 conceivably occurred somewhere within the Eurasian Steppes or the Middle East and Caucasus region as they lie between South Asia and Eastern Europe"
↑ Myres; et al. (2011). "A major Y-chromosome haplogroup R1b Holocene era founder effect in Central and Western Europe". European Journal of Human Genetics. 19: 95–101. doi:10.1038/ejhg.2010.146. PMC 3039512 . PMID 20736979. ↑ Rootsi; et al. (2012). "Distinguishing the co-ancestries of haplogroup G Y-chromosomes in the populations of Europe and the Caucasus". European Journal of Human Genetics. 20: 1275–1282. doi:10.1038/ejhg.2012.86. PMC 3499744 . PMID 22588667. ↑ "West Asian clusters compared with Europe and Asia". Retrieved 19 April 2014. ↑ "West Asian and European clusters, PCA plot". Retrieved 19 April 2014. ↑ "Concomitant Replacement of Language and mtDNA in South Caspian Populations of Iran". Retrieved 19 April 2014. 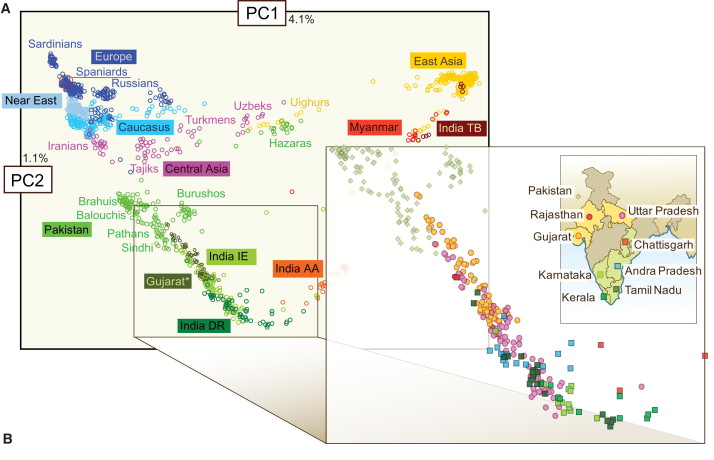 ↑ "PCA plot West Asian_European_South Asian populations". Retrieved 19 April 2014. 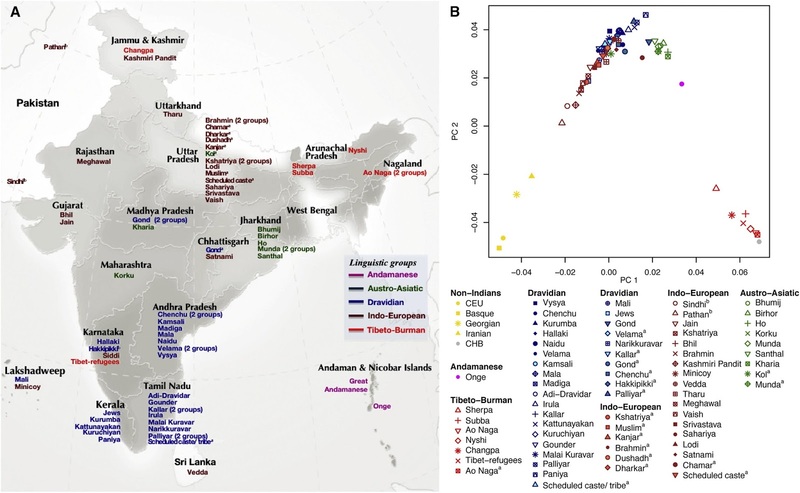 ↑ "Major admixture in India took place ~4.2–1.9 thousand years ago (Moorjani et al. 2013)". Retrieved 19 April 2014. ↑ Grugni (2012)p="Iranian groups do not cluster all together, occupying intermediate positions among Arab, Near Eastern and Asian clusters"
↑ Grugni, Viola; Battaglia, Vincenza; Kashani, Baharak Hooshiar; Parolo, Silvia; Al-Zahery, Nadia; Achilli, Alessandro; Olivieri, Anna; Gandini, Francesca; Houshmand, Massoud; Sanati, Mohammad Hossein; Torroni, Antonio; Semino, Ornella (18 July 2012). "Ancient Migratory Events in the Middle East: New Clues from the Y-Chromosome Variation of Modern Iranians". PLOS ONE. 7 (7): e41252. doi:10.1371/journal.pone.0041252. PMC 3399854 . PMID 22815981 – via PLoS Journals. Beckwith, Christopher I. (16 March 2009). Empires of the Silk Road: A History of Central Eurasia from the Bronze Age to the Present. Princeton University Press. ISBN 0691135894. Retrieved 29 May 2015. Harmatta, János (1992). "The Emergence of the Indo-Iranians: The Indo-Iranian Languages". In Dani, A. H.; Masson, V. M. History of Civilizations of Central Asia: The Dawn of Civilization: Earliest Times to 700 B. C. (PDF). UNESCO. pp. 346–370. ISBN 978-92-3-102719-2. Retrieved 29 May 2015. Wikisource has the text of The New Student's Reference Work article Iranians.